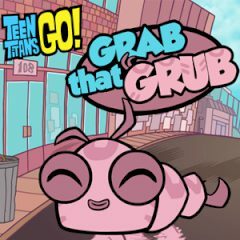 'Grab that Grub' is all about Cyborg keeping Silkie safe during a dangerous dash through the city. Starfire has asked Cyborg to take her pet worm, Silkie, for a walk. He's happy enough to help, but he soon finds out it's harder than he thinks to keep that mischievous silkworm safe from enemies, obstacles and other dangers. Run, jump and crash through barriers as you try to get Silkie safely to the goal of each level.